WESTBROOK–John Morgan, co-founder and chairman of the Rosevelt Soccer Club, traveled to Iceland in late February for a meeting with officials from the Football Association of Iceland (KSI) and representatives of three soccer clubs in the country. Morgan helped found the Rosevelt Soccer Club in 2014, hoping to provide an affordable option for athletes who want to looking to complement their school and municipal soccer experiences with premier soccer experiences. Joining many or even most premier soccer clubs, and traveling with them, can prove prohibitively expensive for players and their families. Over the last five seasons, the Rosevelt Soccer Club has grown to ten teams with 170 players between the ages 8-18. The Club offers competitive programming that has nevertheless saved its players’ families at least $200,000 in registration fees. Kids from across Southern Maine are members, but most hail from Westbrook, Gorham, Windham and Scarborough. A meager 330,000 souls populate Iceland, making it about a quarter the size of Maine. Still, the country qualified for the 2018 FIFA World Cup and the 2016 UEFA European Championships, two of the most prestigious and tough soccer competitions in the world. Morgan’s visited the island nation from February 21-24, meeting with the national soccer association’s director of education, as well as representatives from the Icelandic clubs Breidablik FC, Grindavik FC, and Vikingur FC. 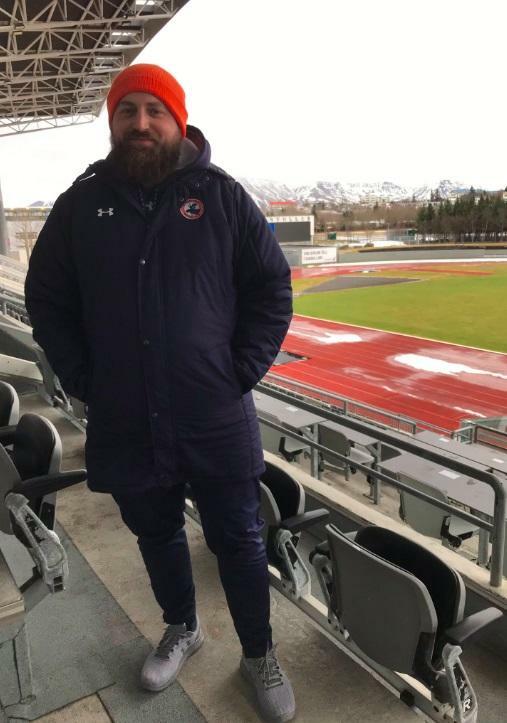 Morgan also observed an Icelandic U15 Girls national team training session, and attended an off-season friendly between two of the country’s forty-seven clubs that have youth and professional teams under their umbrella. Morgan collaborated with Dana Eidsness, Director of the Maine North Atlantic Development Office (MENADO), and Larus Isfeld, a co-founder and a partner with the New England Ocean Cluster, to organize the excursion. Morgan poses at Laugardalsvollur, the national stadium in Iceland, and the birthplace of the famed Viking Clap. Photo courtesy of John Morgan.